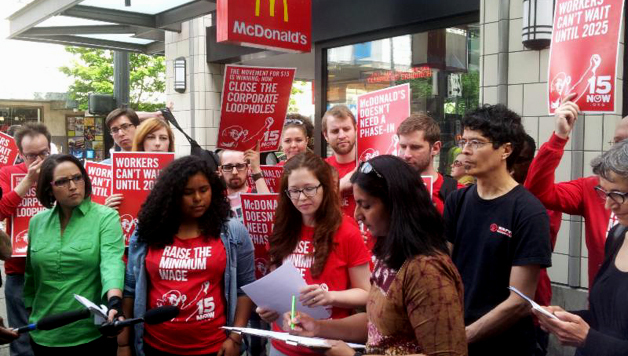 On the same day fast food workers are walking off the job in 150 cities in the U.S. and over 30 countries around the world 15 Now is officially starting to gather signatures for its $15 an hour charter amendment. The first to sign the petition to get the amendment onto the ballot was City Councilmember Kshama Sawant. Sawant was joined by low-wage workers and trade union and community organization leaders, including APWU Greater Seattle Local vice-president David Yao, IBEW 46 PAC Secretary Treasurer Angela Marshall, the Executive Director of Casa Latina Hilary Stern, Somali American Public Affairs Council’s Omar Mumin, and the Organizing Director of 15 Now, Jess Spear. “A new poll shows that a majority of people in Seattle are against a big business phase-in. It is unreasonable to give McDonald’s and Safeway 3 to 4 years to go to $15 when they are entirely capable of doing it right now. We will be bringing 20,000 signatures to the City Council before they vote to demonstrate the huge support for closing these corporate loopholes,” said Spear. The 15 Now charter amendment has large businesses paying $15 an hour starting Jan 1, 2015 while small businesses and non-profits will have a 3 year phase-in. The Mayor’s proposal has a 3-4 year phase-in for large businesses and a 5-10 year phase-in for small businesses. It also includes a tip and healthcare penalty while the charter amendment would make $15 the baseline for all workers with tips and benefits on top.